Can the Wacom-designed S Pen give the Galaxy Note 10.1 an edge? The S Pen certainly adds a new dimension to the Galaxy Note 10.1 and we like the bundled apps that Samsung has included. Once you look past the S Pen, however, you're left with a tablet that doesn't offer anything particularly exceptional. 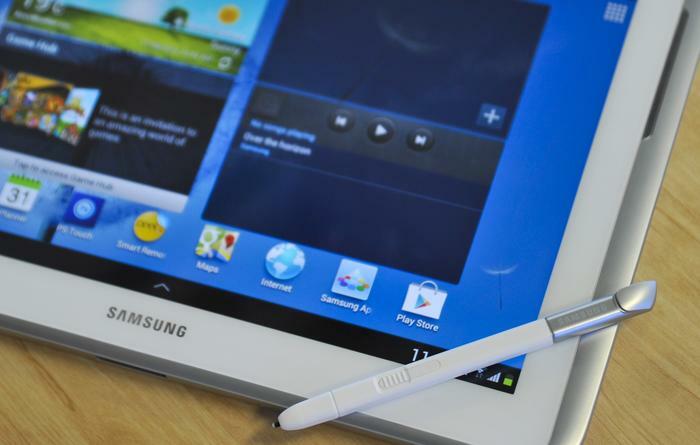 Ultimately, the Galaxy Note 10.1 is an average Android tablet with a stylus. That just isn't good enough in such a competitive market. The popularity of Samsung's Galaxy Note smartphone, which has already sold 10 million units globally, appears to be the prime motivation behind the company's latest tablet, the S Pen equipped Galaxy Note 10.1. The stylus and Samsung's software additions an extra element to this tablet over rival devices but the rest of the package is a little disappointing. The Galaxy Note 10.1 ultimately has a bland and uninspiring design and offers little outside the S Pen to recommend it over the competition. Update: The 16GB, Wi-Fi only model of the Samsung Galaxy Note 10.1 is now available through Samsung's new Experience Store at 450 George St, Sydney. The tablet will also be sold in JB Hi-Fi and Harvey Norman retail stores, with 3G capable models coming at a later date. Note: Our review unit was supplied by online store MobiCity. The Galaxy Tab 2 10.1 Mk. II? The Galaxy Note 10.1 is a standard looking tablet that does little to impress. In terms of design, it's fair to say Samsung hasn't broken any new ground with the Galaxy Note 10.1. The company has stuck with an almost identical build to its Galaxy Tab 2 10.1 tablet. The Samsung Galaxy Note 10.1 has the same silver bezel on either size, the same speaker placement and a virtually identical button placement. There is nothing essentially wrong with basing a device around a previous product, but in this case the design of the Galaxy Tab 2 10.1 wasn't particularly appealing to begin with. The end result means the Galaxy Note 10.1 is a rather standard looking tablet that does little to impress on first glance. The only real difference between the Galaxy Note 10.1 and the Galaxy Tab 2 10.1 is the back of the tablet. 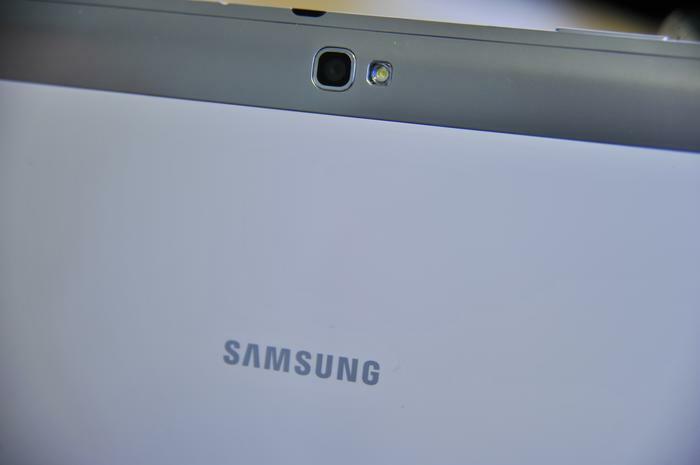 The Note 10.1 has a silver backing that drops down to highlight the camera and single LED flash, where the Tab 2 10.1 keeps the same white panel on the entire back surface. Samsung hasn't broken any new ground in terms of design. Looks are much about personal preference, but build quality is a different matter altogether. Sadly, the Galaxy Note 10.1 doesn't fare too well in this department either. While not exactly feeling cheap and nasty, the white plastic backing feels a little hollow and physically depresses when even slight force is applied. We also spotted a minor defect in the glossy finish on our review unit, looking somewhat like a dust particle got caught on the back before the final finishing coat was applied. This isn't a huge deal breaker but as a reputable, top brand, Samsung should pay more attention to detail when it comes to its finished product. The design of the Galaxy Note 10.1 isn't all bad news, by any means. We do like its light weight, which actually makes it more comfortable to hold than the heavier iPad. The rounded corners and smooth edges means the Galaxy Note 10.1 has impressive ergonomics. Samsung has also left enough room for a microSD card slot on the top, which makes it easy to expand the internal memory. Finally, both the power/lock button and the volume controls on the top edge are well placed and provide good tactility, and the effective speaker placement means your hands won't ever muffle the sound. The Galaxy Note 10.1 can't display the same super crisp text as higher resolution screens. One feature where Samsung has missed the mark is the Galaxy Note 10.1's display. The 10.1in PLS TFT screen has a rather standard resolution of 1280x800 and a pixels per inch rating of 149ppi, significantly less than the new iPad. It's certainly not a bad screen by any means, offering impressive brightness, excellent viewing angles and a natural colour tone that doesn't oversaturate. However, it can't display the same super crisp text as higher resolution screens. It's not just the iPad either. The newly launched ASUS Transformer Pad Infinity and the upcoming Acer Iconia Tab A700 are two Android tablets that have much higher resolution screens than the Note. This immediately makes them more appealing devices. The Samsung Galaxy Note 10.1 can't display the same super crisp text as higher resolution screens. 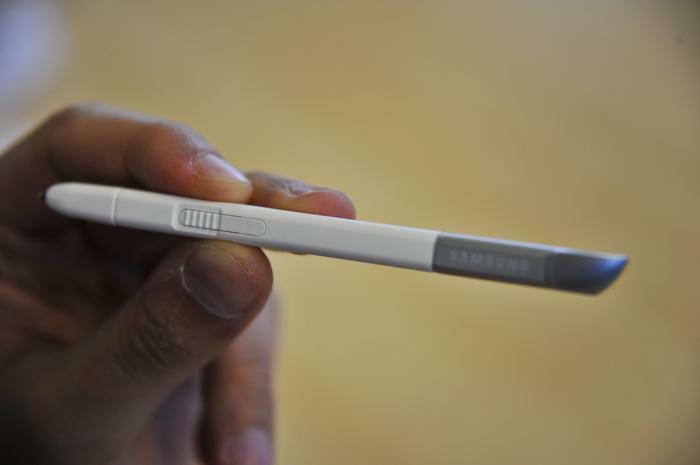 The S Pen feels more like a pen than most other stylus products we've used. 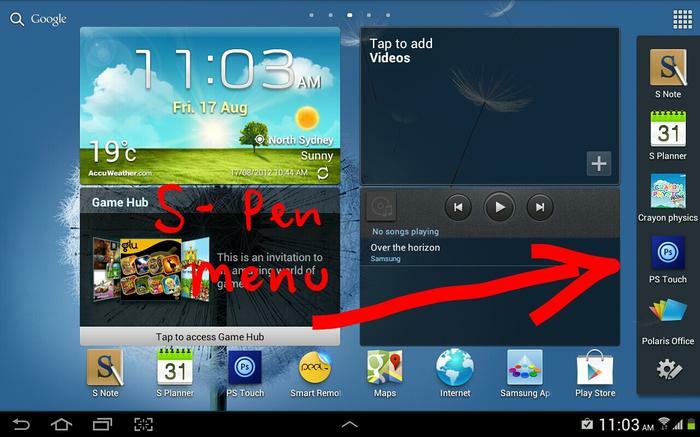 The crowning feature of the Galaxy Note 10.1 is obviously the S Pen, Samsung's fancy name for stylus. It's stored in a compartment on the bottom right of the Galaxy Note 10.1 and is easy to slide out. We prefer this new S Pen to the one Samsung used on the Galaxy Note smartphone as it's thicker and therefore more comfortable to hold. It's a little shorter than an ordinary pen, but it feels more like a pen than most other stylus products we've used. The S Pen is responsive and there's not too much lag when you're drawing or writing on the screen. It's not just an ordinary stylus, either. Samsung officially says it has 1024 levels of pressure sensitivity. This means a firm press increases the width of any on-screen drawing or writing, provided you're using the S Pen in an app that's been developed to utilise the feature. It's impressive in action and really adds a new element to writing and drawing. The S Pen feels like a real pen and is comfortable to use. The S Pen has a few nifty touches. An on-screen cursor can be set to appear whenever the S Pen hovers close to the screen, without actually touching it. Samsung has also built-in palm rejection support into the tablet, so when you're using the pen you can rest your palm on the screen without accidentally bumping anything. This feature works reasonably well, though if you're right handed you can still accidentally bump the notifications panel in the bottom corner. If you're left handed, we suspect the same will happen with Android's back, home and multitasking on-screen keys on the other side, too. Samsung hasn't just dumped the S Pen on the Galaxy Note 10.1 and left it at that. The company has clearly thought about user interaction, highlighted by the convenient quick launch menu that appears when you remove the S Pen from the tablet. You can't edit the five apps that appear, which is annoying, but it at least shows that Samsung is clearly thinking about using the device from a consumer perspective. The Galaxy Note 10.1 also comes with a range of software specifically designed to work with the S Pen including Samsung's own S-Note app and the pre-loaded Adobe Photoshop Touch, Polaris Office and Crayon Physics apps. The highlight is definitely Photoshop Touch, which is the same version that's available in the Google Play Store, but it's been optimised to work specifically with the S Pen. 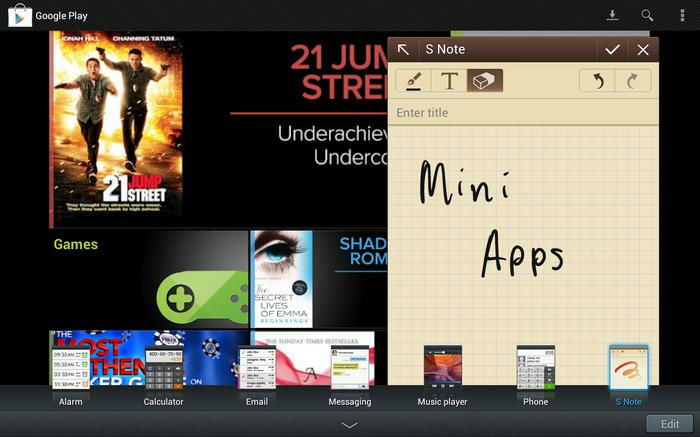 Samsung's own S Note app offers a variety of note templates, such as recipe, story, journal and diary layouts. You can draw, scribble and write using S-Note and there's even handwriting recognition and the ability to solve mathematical formulas. We found the handwriting recognition quite accurate in most instances, though you'll need to ensure you write at a steady pace for the software to recognise all of your letters. All in all, the S Pen itself works well, but the fact it only supports a limited number of apps makes it less appealing than we like. The Galaxy Note 10.1 isn't all about the S Pen. Through its TouchWIZ software Samsung has managed to include some interesting new features. 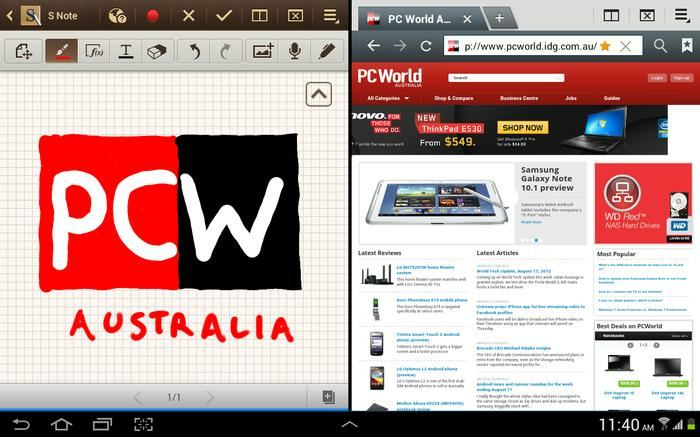 One of the most talked about is multiscreen, a function that allows you to open two apps side-by-side, simultaneously. The concept is an excellent one in theory, but we found it a little slow swapping between two running apps, so it's not exactly instant. The feature is also limited to six apps for now — S-Note, the default browser, video player, Polaris Office, the gallery and Samsung's e-mail app. The fact it can't work with Google's Chrome browser or Gmail, for example, is a real downside, but if you use any of the compatible apps on a regular basis it's definitely an interesting feature. The multiscreen function allows you to open two apps side-by-side, simultaneously. There's a few other excellent features, too. We like the pop-out video player, which allows you to open a video in a floating window that can be dragged anywhere on the screen. The idea is that you can perform another task, such as check your email or browse the web, while still watching uninterrupted video. This feature is borrowed from Samsung's Galaxy S III smartphone but makes much more sense on the larger screen of a tablet. It's also an impressive demonstration of the Galaxy Note 10.1's powerful internals at work. The "quick panel" toggles in the notifications pop-up is a nice idea and adds toggles for Wi-Fi, GPS, sound, screen rotation, power saving, Bluetooth, notifications, mobile date, driving mode and flight mode. This makes it very easy and direct to access these settings. Samsung has also added a screen capture button next to the standard back, home and recent apps keys: tapping this button will immediately capture a screenshot of the device. 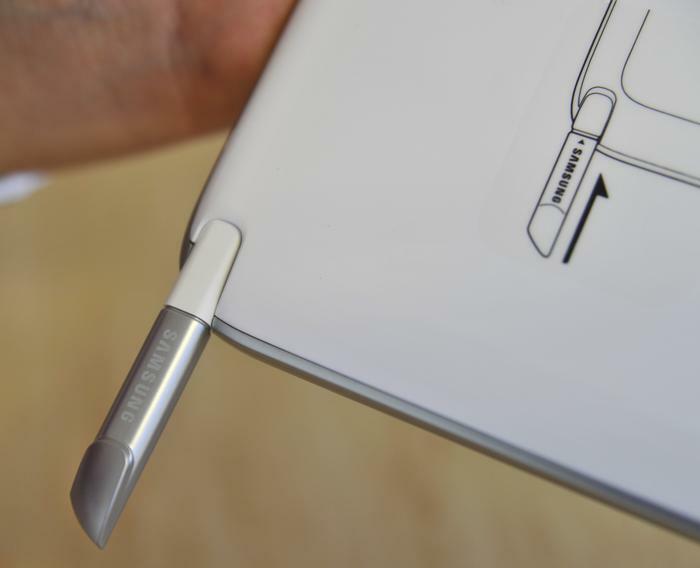 The S Pen slides out from a compartment at the bottom of the Galaxy Note 10.1, as shown above. Samsung also includes a number of "mini apps" on the Galaxy Tab Note 10.1, accessible by tapping a small up arrow at the bottom of the screen. The alarm, calculator, email, messaging, music player, phone and S-Note apps can be opened as an overlay on top of the screen, allowing you to continue using any other open applications. The concept is notable, but the mini app tray can't be customised so you're ultimately left with a limited selection. 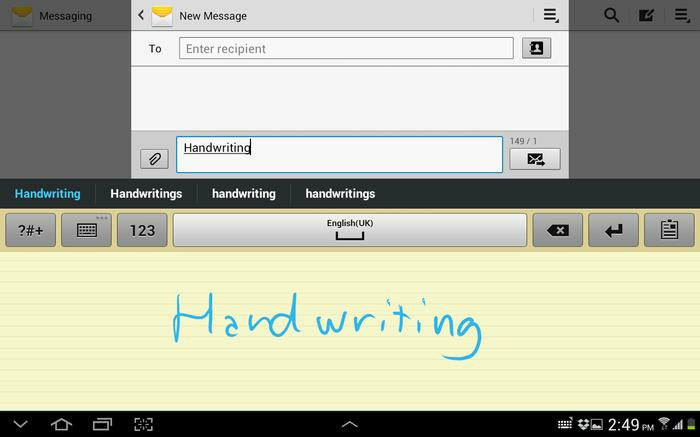 The S Pen enables handwriting recognition. TouchWIZ does little to tie into Google's standard holo UI theme. Samsung pre-loads the Galaxy Note 10.1 with a number of apps above and beyond what Google provides. We like the Allshare Play DLNA app, allowing you to beam content between the tablet and DLNA devices like TVs, while the file manager, Polaris Office and video editor apps do add some value. While we like many of the extras, we're not a fan of the overall look and feel of TouchWIZ, which does little to tie into Google's standard holo UI theme. A more pressing problem than looks is the fact that TouchWIZ appears to impact on performance. The Galaxy Note 10.1 isn't as sluggish in general use as Samsung's Galaxy Tab 2 10.1, but it often feels a little laggy, even when performing basic tasks. This is especially evident in transitions between home screens, opening and closing the app draw and scrolling in the Web browser — tasks that really shouldn't lag. This basic issue is even further compounded by the fact that we experienced no problems when playing graphically intense 3D games, such as the excellent Dead Trigger and Shadowgun 3 titles. This suggests the Galaxy Note 10.1 is certainly powerful enough to provide a smooth experience, so we're at a loss as to why it still lags. Samsung includes a number of "mini apps" that can be opened as an overlay on top of the screen. Most of Android's common issues are apparent on the Galaxy Note 10.1 as well. The browser lags when scrolling or zooming in on pages, especially image-heavy sites. The screen takes too long to rotate when you change the orientation. There aren't enough Android apps optimised for the larger, 10.1in screen size. A good example is the Spotify app, which ridiculously only works in portrait mode because it was designed to be used on a smartphone and not a tablet. Apps like Facebook, Twitter and Dropbox are other examples of smartphone apps simply blown up to fit the Galaxy Note 10.1's larger screen, creating a poor user experience. The Samsung Galaxy Note 2 10.1 has a 5-megapixel rear camera for still photos and video recording and a front-facing 1.9-megapixel camera for video calling. The rear camera comes with a single LED flash but it takes largely poor photos. Unlike the Galaxy Tab 2 10.1, the Galaxy Note 10.1 at least has touch to focus capability, but we found it difficult to capture close objects without blurring the image. Any photos or video captured with the camera can be stored on the Galaxy Note 10.1's internal memory or the microSD card, which isn't included in the sales package. The 5-megapixel rear camera takes poor quality photos, but the front-facing camera works well. The 1.9-megapixel front facing camera also captures poor quality photos, but it's at least useful for video call apps like Skype and Tango. We found it worked particularly well for Skype calls over Wi-Fi, with the quality slightly better than most other front cameras we've tested. Our review unit of the Galaxy Note 10.1 came with a an infrared port and a pre-loaded remote control app called Peel Smart Remote. This is an excellent feature which enables users to use the tablet as a universal remote control for other devices, like televisions, Blu-ray players and other home entertainment products. It is unknown if any potential Australian model will include the IR port — the feature was an omission on Australian Galaxy Tab 2 10.1 models despite being available on variants of that device sold in the US. 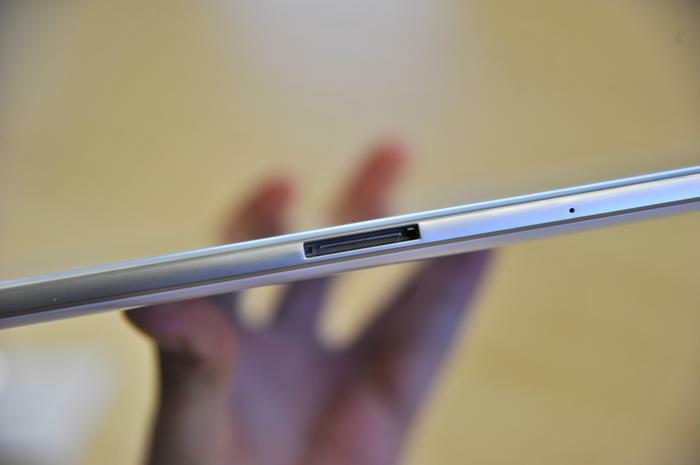 Samsung's proprietary dock port at the bottom of the Galaxy Note 10.1. We found the Samsung Galaxy Note 10.1 to have reasonable but not outstanding battery life. In our tests, it lasted for around eight hours before needing a recharge, a couple of hours less than the new iPad. How much juice you can squeeze out of the battery will depend on how often you use it. With around two hours of use per day we were charging the Galaxy Note 10.1 every two or three nights, which is a fair but not outstanding result. The 16GB, Wi-Fi only model of the Samsung Galaxy Note 10.1 is now available through Samsung's new Experience Store located at 450 George St, Sydney, and will sell for $589. The tablet will also be sold in JB Hi-Fi and Harvey Norman retail stores, with 3G capable models coming at a later, unannounced date. You can also buy the Galaxy Note 10.1 from online store MobiCity, who supplied our review unit. 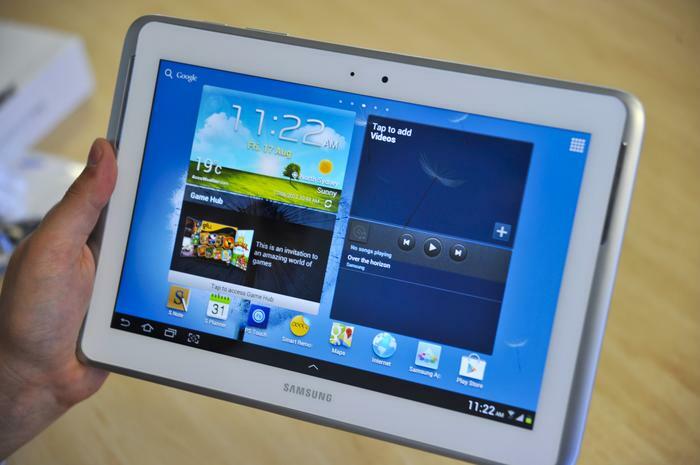 • Where can you buy the Samsung Galaxy Note 10.1?